This is the Honduras Las Capucas brought to you by Mela Coffee Roasting Company. Grown by the various small holder producers in the Copan region at 1,450 - 1,700 meters, this Organic certified and fully washed coffee is a perfect example of why we love coffees from Honduras. The cup is rich and full bodied with notes of deep chocolate and roasted nuts. Good coffee but definitely not my type of roast. I didn't mind drinking it every day but I wasn't excited for it. Very chocolatey flavors come through, which makes me think this would make an excellent espresso. As described, not my preferred flavor profile. fresh and good taste. just a little bit of a strange/more bitter aftertaste. Not my favorite. It was good, but lacked something for me I can’t describe. Sumatran have been my favorite flavor profile. I made this in my V60 Hario and it is definitely a full-bodied cup. Darker than I normally like, but I can appreciate a good quality coffee bean. I'm more into the lighter roast personally. This one was just ok for me. It was a bit too bold for me. Tasted a bit harsh, burnt. I’ve now made about 6 servings in my Aeropress. I started with my trusted recipe, tried the Mistobox recipe, have played with water temp and grind size. Still all the cups have been fairly bitter. I get some of the chocolate notes but not very smooth. Update: I’ve found the right combination for the Aeropress and am now getting much less bitterness..
Good but not great. A little darker than average but a bit bitter tasting. Chocolate and roasted nut flavor is very mild and does not stand out. Overall I enjoyed it. a little dark for me! It's not that this is a bad cup of coffee, it's just not what I like in a cup of coffee. I prefer a medium to light roast and more of a citrus or fruity flavor, which this coffee definitely isn't. Not really sure why this was the first coffee sent when it doesn't align with anything I filled out in my profile. The coffee was very good, a little on the dark side for what I normally like, but still am enjoying it quite a bit. Very light brew. Did not have a very strong flavor and too mild for my taste. It was ok. Looking for something fruitier. A little too full and dark for my taste, but great coffee and flavor. Good flavor. Brewed exceptionally well in a Chemex. However, a little too dark and bitter for my tastes. Did not enjoy much. It's lacking any standout flavour/aroma. The nutty chocolate hints are so subtle that it just gets lost in the mix. Perhaps would be better for a winter mid-day coffee, but it didn't have any bright notes to cheer me up for the day. If there was a bit of orange added somewhere, I think it could elevate this much more. When I opened the box, I was greeted with a wonderful aroma. In regard to the taste of the coffee, it's good. This is my first time trying out single source vs blend. I’m doing it to try and see which parts of the world I like in terms of coffee. I’m also just starting To try and explain what I do and don’t like about coffee. For this one it was a bit too tangy for me. Great flavor but could have been a bit stronger. Probably would have given it a 4.5 if that was possible. Loved this, though I'm still trying to find out my coffee preference. Maybe I could try something a little lighter/fruitier next? Delicious but a little mild. Brewed in french press. Drinking it black- milk would make it too mild. this one has been a bit too dark and bitter for me. I might try to mix it up and do a pour over here in the next couple days. Meh... not very flavorful. Pretty bland actually. I keep trying it expecting to get something out of it but it’s just a decent coffee. I have only had it once so far, but it was really good! Still learning to appreciate coffee fully and the different flavors a coffee can have. Would maybe like to try something with some fruity notes. But definitely would try something similar to this again. Looking forward to my next cup of this! We would order again. Michael loved it. I thought it was a bit strong, like a darker roast than our normal. But great stuff. Too dark and bold for my liking. Smelled and tasted a bit burnt. This was a departure from what I normally drink and I loved it, although there was a hint of acidity to it. My favorite thus far. It’s a really smooth coffee that has a full body with the slightest nutty feel that is really enjoyable any time of day. Roast was too dark for my liking as a pour over. Preparing as an espresso was much better - it takes well to milk also. It was a little "earthy"
So far so good! I think I'm learning that I like a more full bodied coffee that has similar notes of chocolate or nuts. Good but I wish it had more fruity flavors. A nice roast and well balanced. Much more my style of coffee that I seek out. 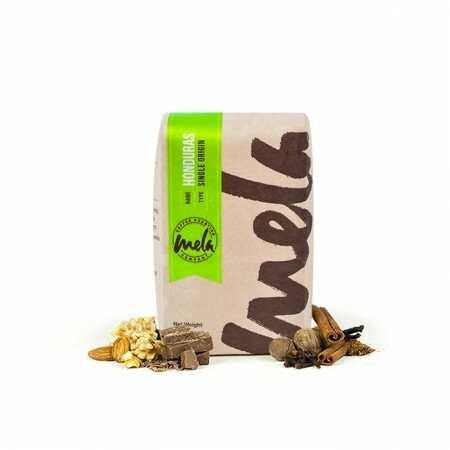 Mellow on aroma, great for low acidity, fair flavor. More acidic than I expected. Tried in French press at first, will need to try in V60 and MoccaMaster. Balanced flavor; nothing that was too overwhelming. Wow! This is really good too! Smoother than the Mexico Maya Vinic...less bite. Not necessarily chocolatey, but with silky chocolate characteristics. And, the nuttiness is cool. I'm torn. I'm brewing these up using my grandmother's old glass Pyrex stove top percolator, and the coffee's outrageous! I tried many different ratios of water/coffee, a variety of dose sizes, along with pour over, french press, and coffee maker brew methods. This coffee hit me with an immediate astringency on the tongue. I couldn't get past the dry and bitterness. Too much body for my preferences. Solid coffee. No complaints at all. Just not exactly what I was looking for. I hope to try a Guatamalan coffee next. I think I am looking for more a citrus like taste. I don't like anything roasted darker than this but do like full flavor. not sure if I am describing the taste correctly, but to me it seemed too bitter. Maybe I do like darker roasts? The problem is when the beans are oily, my coffee maker does not like it too much. Nicely balanced and slightly sweet, smooth and no harsh notes. mild in boldness -- a good starter coffee. easy to drink. Tried with French press and Chemex. Better with Chemex. French press was too muddled. Well rounded cup with deep flavor and great notes. So far I've primarily brewed with AeroPress and each cup has gotten better as I figure out the strength of this coffee I like. Pairs well with chocolate. Enjoyed the rich chocolate flavor. Well balanced. Roast was fine, but would be interested in trying something more lightly roasted with a bit more acidity. Delicious, smooth, chocolate notes, nutty, delicious! Noticeable chocolate flavor, probably the first coffee I've been able to say that about. Smooth, medium mouthfeel. Slightly acidic after taste but not bad. We enjoyed this! This was a decent coffee. I was a bit over roasted for my taste for sure. We are enjoying this coffee, great flavor! Thinking we would like to explore something a little bolder, though. I do not consider myself to have an excellent coffee palate, but I’m trying this experience to improve my appreciation for different coffees! I did not pick up as much chocolate as I was hoping, but I liked the nuttiness! this coffee is really good. I'm enjoying it. roast was way too dark, don't like the slightly burnt taste. couldn't really taste any other listed flavors. I drink coffee black, no sugar, the burnt taste is all I can decipher. This is a coffee I'll bail on (throw beans in garbage and try the next one), can't really drink and enjoy. Coffee pretty good. Rich, so must like your coffee dark to enjoy IMO. I enjoyed more than my wife. Great flavors and full body. Excellent cup of coffee. very much. A great beginning. This coffee matched precisely its description. It favorably broadened my conception of how a Honduran coffee can taste. Typically I'd expect a more subtle profile and a little bitterness or acidity, but this one had a beautiful, chocolatey body without being too strong or overpowering. Delicious. Delicious, maybe a little lighter than expected when brewed. I have a Hario V60 and a french press so I have been experimenting using these two methods to brew my morning coffees. I tried the approach recommended by Mistobox for the Hario V60 using double the amount of water in the first stage for the bloom process and the remaining water for the last step. The coffee to water ratio by weight is usually 1:16 for this process. The coffee I have been getting is a bit on the sour side and I cant really notice the chocolate or roasted nuts notes. I think i am either messing up the ground size ( i set it to medium-fine) or the time of pour for each stage. Any recommendations you have about how to improve this would be great. With the french press I get a more full bodied brew but I fail to taste the notes with this method as well. I usually use a 1:17 ratio for the coffee:water ratio by weight for the french method. I have used french press in the past before so I am more confident with this approach but I'd like to become an expert in the pour over process since I have heard and read that pour over coffee tastes amazing. Love love love! This coffee is amazing. I don't know how to describe the flavors or notes much for coffee but from the description I'm thinking I like the full bodied and nutty aspects of this coffee. I like to stay away from anything floral or citrus-y. Thank you! Smooth taste; just a bit of twang/sour. It was easy to make with my French press. Way too light, good flavor but like the coffee to be much bolder. I found this coffee to be smooth and flavorful! Definitely delicious! I suppose it felt on the lighter side (not a bad thing), and I wouldn't mind exploring slightly darker roasts...? Delicious! Not too bitter, we drank it black. Nice deep flavor and aroma with chocolate and roasted nut flavors subtly evident, more medium than full bodied tho, nicely low acidity, would purchase again! First impression was it was very bitter. I added cream to the coffee and it mellowed out a little and it tasted better. The primary flavor was bitter and any other notes were very subtle. I prefer fuller flavors. I liked the nuttiness but wanted a little bit of acidity too. I think the roast was a little on the dark side and probably would prefer a lighter roast. I prepared this with a Chemex and tried it both black and with cream. The Honduras coffee is what we consider a medium roast and full bodied. It has an earthy subtle flavor and is smoothly balanced. Very nice start to our new coffee experience. Nice. Seems more on the medium-bodied side. Usually prefer "oily" flavor without bitterness. I really liked this coffee best when I used it for my French Press. When I used it for my regular coffee maker it was very smooth but seemed light. In my French Press it was very flavorful, smooth and I really liked it for that better. Good mild coffee. Would like to try something a little stronger next time. I like it; maybe a stronger brew next time with the same qualities? Thanks! Really liked this coffee once I added one more tablespoon of coffee. Chocolate notes on the smell, rounded, smooth, and holds its strength. I enjoyed the roasting degree. Las Capucas was great, I will drink it when I want a more balanced cup. I'm more interested in something with complex and wild flavors. I really enjoyed this 1st shipment, but have no other magic beans to compare to. Looking forward to the next bag! We liked it! Definitely a fuller body light coffee. Nicely balanced. Good body. Good roast. Prepared as pour over/chemex. Touch on the bitter side of my taste and lacking floral/fruit notes that I enjoy. But nice cup overall. The coffee from these beans was not bad, it just wasn't particularly notable. The tastes were muted and bland. I adjusted my coffee profile since you sent me this one. This was too chocolaty and not fruity enough for my taste. I don't have a very mature palate or the vocab for this just yet, but I liked this one a lot. Smooth and pleasant taste. Great body but not over-powering. It was nutty with good notes of chocolate. It was not very complex. I would like to try something a bit more complex. However, this Honduran made a good tasting cup. I enjoyed this coffee. If I had to be picky I would say that I prefer roasts that are a bit lighter than this one, and enjoy coffees with sweeter and more floral notes-caramel, honey. Smelled earth and buttered toast. Pretty good but not memorable. Good coffee with a very approachable flavor. Lacks a little excitement for me however. Amenable to suggestions on method, tasting (notes), or coffee. The coffee was excellent. Perfectly roasted. Full of flavor with no acidic bite. I enjoyed the darker chocolatey notes that I was tasting, but I wish it had a little bit more flavor to it. Just ok. We like a more robust roast. A little too darkly roasted for my taste. Definitely stronger nut flavor than chocolate. Brewed it both in the Clever and the french press. I like it better in the Clever. Liked the almond notes in this one. Might need to adjust our grind, because it didn't seem as full bodied as expected. This coffee was a great pick. Can’t wait to try another. Beautiful and smooth. A cup of coffee you can drink by itself. Definitely a full-bodied coffee! Rich, chocolate notes throughout. I'm moving more toward medium-roast coffees lately, so this robust coffee is pushing my limits of dark roast. However, the coffee is quite good. I brewed with my siphon pot, using a cloth filter. I'll brew tomorrow with the metal filter to see how it affects the flavor profile. Truly enjoyed my first cup. As stated in the notes it was full bodied with notes of chocolate. I must admit I did not drink it black. I added some coffee cream but none the less it was very good. I shared the cup with my wife and she was impressed with how smooth and tasty it was.. It would have been nice to have suggested brewing tips. I think I may have put too few beans, and too much water as my cup this morning tasted a little on the lighter side. I'll try less water and more beans tomorrow. Excellent flavor, fresh notes, perhaps a tad lighter of a roast than I have become accustomed to recently, but would absolutely indulge upon again! We really like how smooth this coffee is (my husband doesn't mind bitter coffees, but I do! ), but would love to try something with a bolder flavor. Thanks! This coffee was great in the aero press and the espresso! Great deep taste. Good but very subtle flavor. Great aroma, well balanced bright notes. Enjoyed the chocolate flavours. I wouldn't buy it at the store. Also if I got it at a shop, I would ask for another kind everytime after. Low taste and bland, but smooth. I liked the flavor but maybe it was slightly to full bodied. I don't know if this coffee is high in acid but it seems to bother my stomach a bit. Looking forward to the next batch. Great coffee! Strong flavor but not overly acidic. I will definitely get this one again. The whole beans are a medium chocolate color and have a very bright aroma with strong citrus notes on the nose once ground. The coffee itself has a decent amount of oil to it, which I found appealing, and the flavor was more earthy and less citrusy, which was a surprise, given how pronounced the citrus scent was after grinding. The coffee is well balanced and not too acidic, which is always a positive. Overall, I would rate this coffee a 7/10. I'm very pleased so far with the curated coffee. I've been more or less stuck in a rut of darker roast French and Italians for years now, so I'm hoping to branch out a bit and try something new with Mistobox. Well done on this selection- it's very different from my "norm" and it is delicious. A decent coffee, and I can definitely taste the notes of chocolate. In general, I like coffees with bit more acidity. a little too earthy and slightly bitter on the finish. Too weak. Please send darker roast next time. The flavor is good but a little bitter for my taste. LOVE this! Just what I was looking for!!! Bit bitter on a chemex for my taste. Typically prefer something a little lighter roasted. Good except a little too much on the dark roast side. a bit too bitter aftertaste for me. Didn't make for so hot of cold brew. Despite measuring to the gram and brewing for 24 hours on the dot, the concentrate came out less-than full-bodied, mostly just bitter. I liked the freshness of the roast. That was the biggest plus of ordering a custom roast, in my opinion. Secondly, the subtler flavor of the coffee was also nice. Most of the coffee I purchase from the stores are disappointing due to the old roast or heavier heat treatment. In the next batch I will probably look for more fruity notes and less of darker notes. Something from the higher altitudes and dried naturally sounds good. I did not enjoy this one as much as the first coffee I was sent. It was still good. But I found the roast to be a little dark and the taste to be a little heavy. If that makes any sense haha. Still a good coffee. Just not as good as the first one. Love this coffee! Honestly, everything about it is delicious. The aroma of the beans, the taste of the Brew. So good. Really like this pick. Great taste and smell. Enjoyed having a cup and could drink it all day! The flavor of the coffee is good, but it is too acidic for me. Using a tried and true Aeropress recipe, the flavor tastes really underwhelming, and also a bit burnt. Love the flavor and very smooth finish. I enjoyed the chocolate notes and fullness of the coffee. I did like that it was smooth as well, but would have preferred it to have a little bit more smoothness. Almost a velvet texture would be amazing. I would like to see my next option be more of a light to medium roast with a lot of complexity showing notes of fruitiness and citrus. I’m open to any suggestions as I will leave the decisions to the experts. Liked it better than my first order. Definitely lives up to it's description! Thought it was great! Still learning the brewing process, but really enjoyed this one. Would love to branch out and try some similar flavors. Good but not as good as the first two. Great beans and great roast. Just right for Chemex, or other methods. My wife and I were pretty disappointed in this one. It smells and tastes like bad diner coffee. Love this coffee. Very nice smooth flavor. This is one of the best coffees I have ever had. It smells wonderful, and has an amazing and full taste to it! It is very fresh, and is just all around delicious. I will definitely purchase more of this in the future. This coffee has a lot of chocolate flavor and has a very clean finish. It was very easy to dial this one in for espresso. However, a lot of the flavor of this coffee is lost if diluted with milk for a latte or with water as an Americano. This coffee would likely make for good cold brew and pour over, though I haven't tried either brew method yet. I love this coffee! The flavor is mellow and full bodied. I love the hint of chocolate and roasted nuts! This is a great versitile coffee. Frech press / drip / espresso it has been great. I feel that you need a bit more coffee than some to get the full flavor and body that I want out of my morning coffee. But once I figured out the proportions it is a good cup. WHY IS THIS ROASTED SO POORLY? why is it from July 26th? Out of 3 coffee, all them have been stale, roasted poorly, and near flavorless. Really enjoyed this one. I liked the robustness and distinctive flavors. Appears to be a bad roast. Dark, burnt smell. Rich chocolate tones with hint of nuttiness. Full bodied. Roast dark side of medium. Very good as pour over, even better as french press. Classic non-adventureous coffee for american palate. An excellent breakfast utility coffee. Would like to try something a bit more adventureous next time. Lacked depth of flavor. A little too mild mannered. Really good! Perhaps this might be my fav so far! Very good. Mellow and well-rounded while still being bold and rich. Makes a good cold brew. Did not care for this one much. Didn’t seem to have much flavor. Over-roasted. Definite burnt flavor. Not a fan. Smooth. Could easily drink this without cream. Bonus points for being organic. I realize that I do not care for the smokey flavor in the DCR special dark. . I like this better. More like this, please. I liked this. No perfumy taste. Smooth with no bite but lots of flavor. Felt like it brewed well in an aero press and drip. Not too bitter with a clean finish. This is my 2nd favorite coffee that I received. I liked Tony's the best, then this coffee. Wasn’t getting as much of the full-bodied feel with this one, at least with the pour over I’m using. The nuttiness sits on the front of the tongue with the chocolate bringing up the back of the sip. Really good! Let's try something lighter, yet complex, maybe with a North African Origin. Thanks! I like a lot of different coffees, but this was not one of them. There was almost a strong smoky flavor within the taste that through it off. A pleasant reminder of diner coffee, in the best of ways. Wildly overroasted and a very unforgiving bean. I was very surpirsed at how inflexible this bean was with different brewing methods. Extremely oily and brittle as well. Would be 5 stars, but like the winter Olympics, still waiting for perfection. Had not been impressed with Honduran beans from other suppliers, but this has a wonderful dark chocolate base with lots of mouth filling overtones , and the caramel comes in at the finish. Appreciated the slightly lighter roast as well. Great choice--maybe even 4 1/2 stars! Thanks!! Earthy and full-bodied. Coffee was freshly roasted and had great aroma. Slightly darker than I usually prefer, though. Smooth, with nutty tones in the aftertaste. A slow-grower in the mouth. Slightly more roasted than I prefer, but still a very nice coffee. The beans smelled great and once ground, was even better. The taste was good, not excellent, but I still enjoyed it. I was able to taste hints of chocolate and the coffee was smooth and clean. I enjoy a more balanced coffee but I would still recommend this coffee to anyone. A little too much on the chocolate notes. Perfect roast level. Flavor is subdued and more nutty than expected. My least favorite out of the handful of coffees I have tried on mbox. I found the taste rather bland, sadly. My last selection brewed up a little weak so I appreciated the more full bodied nature of this one. Very good coffee! Would like to try a medium roast next time. Did not enjoy the first cup, but it eventually grew on me. Has a very earthy and raw taste. Just takes a little bit to get used to. Don't mind sippin on it, but not the best cup of joe I've had. We thought it was very bland -I tried using more per pot but it still seemed watery almost. Smooth taste. Easy to go down! Enjoyed it much more than before. Smooth taste, more towards my preference. Although i seem to need to add more beans/grinds to make the equivalent taste that I also prefer. Good. More depth of flavor and/or complexity. Wouldn't buy this one again. Has a bit of harshness. I shortened the steeping time in my french press from 4 minutes to 3.5 minutes and it was better. I liked it a bit less than my first one. I’d say it was pretty similar just slightly “duller” in body and flavor. It's good but I would love something a little more complex, slightly brighter even. Smooth drinking coffee. Tasted the chocolate but not overwhelming. Nice body. Very very good! Enjoyed every cup of this coffee, no matter what the time of day or circumstances. It was delightful. Great tasting coffee. Best yet. Hands down my favorite coffee so far! It’s rich and has a wonderful chocolate flavor.